Hanel Rotomat customised work area. According to Headland Machinery , the Fischer company produces measuring instruments for checking material thicknesses, and the thickness of coatings and lacquers. In the past, 10,000 articles were spread over several storerooms, including external storerooms. The storage set up was inefficient and costly and company wanted to integrate these into a central storeroom next to production. The decision to use Hanel storage systems was made, now Fischer had to decide on the best Hanel solutions, using Hanel Rotomats and Lean-Lifts, to suit their individual needs. 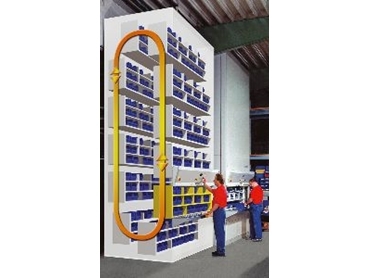 The room height was only about 300 cm and the ribbed surface on which the Hanel Rotomats were to be placed also needed to be taken into account with a load-bearing capacity of just 1,000 kg/m². Various options using Hanel Rotomats and Lean-Lifts were considered, after the computer department had given Hanel the material inventory with the quantities handled. Considering the various container sizes in cardboard and ESD plastic, 12 paternosters would have been required. With a room height of 3m, this would not have been feasible on the planned area so it was suggested that the room height be raised to approximately 6 m. With this height, 6 Hanel Rotomats could be used. 3,786 containers (600mm deep, of different widths and heights) some with subdivisions, were used. This number of containers could be accommodated in 6 Hanel 936 Rotomats, some with spilt-level shelves, and connected to a PC based monitoring system. About 6 months after the Hanel Rotomat delivery, the company ordered another two Hanel Lean-Lifts for storing large parts such as housings and high containers. These were also connected to the PC based monitoring system. The Fischer company came to value the Hanel Solutions and Team. The satisfaction of the employees shows that opting for the Hanel products was the right decision.